1. Make the bread according to the pack instructions. Place in a greased bowl, cover and leave to prove for 30-45 minutes. 2. Meanwhile, chop half the mint. Fry the lamb over a high heat in a frying pan for 3 minutes to brown. Stir in the mint and zaatar, and cook for 3-4 minutes. Leave to cool. Toss the aubergine in 1 tbsp oil and griddle for 2-3 minutes in batches, turning once, until lightly charred. Set aside. 3. Preheat the oven to 220°C, gas mark 7. Grease 2 large baking trays. Knock back the bread dough and divide into 4. Roll each piece into a 20cm circle on a floured surface and place on the trays. Spread with the houmous and top with aubergine slices. Scatter with the lamb and bake for 20-25 minutes. 4. 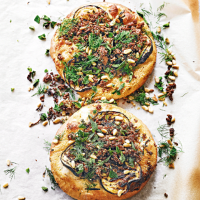 Drizzle with the remaining oil and scatter over the dill, pine nuts and remaining mint.